2013 Steel Industry Softball Tournament! families!) who came out to enjoy the weekend and raise money for the Gaby Davis Foundation. be a great tribute to their co-worker and friend to dedicate this year to him and his favourite charity. • Cloverdale Minor Softball (Esther, Jim and Shelly). • City of Surrey Parks (Brianna and Sonia). • Cloverdale Minor Football (Yera). • Western Stevedoring and Coutinho Ferrostaal. • The Shark Club in Langley. Total Raised this year was $4100.00!! 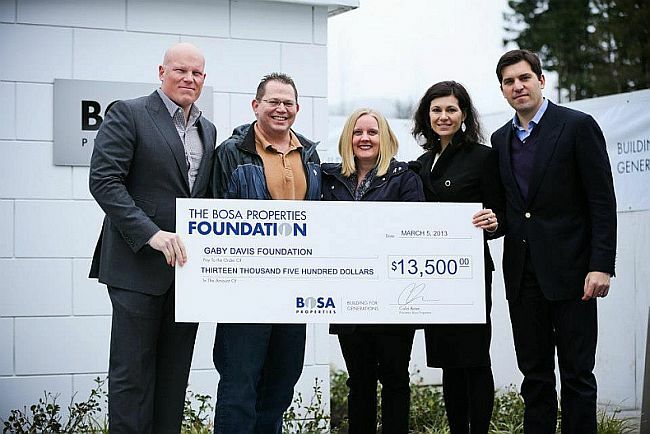 The Bosa Properties Foundation supports GDF! 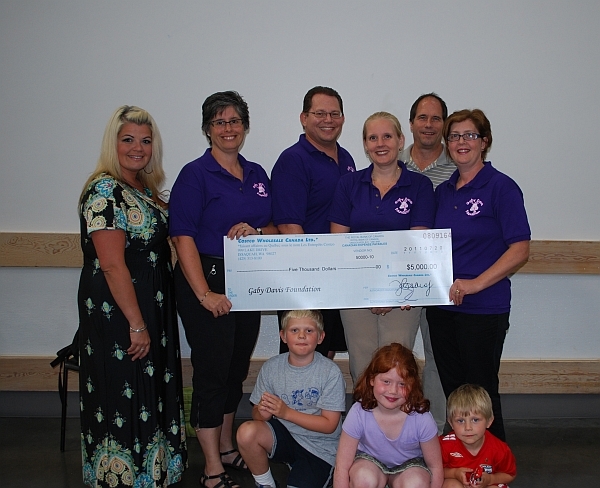 generous support of the Gaby Davis Foundation. 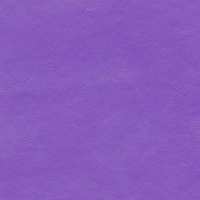 Their generousity will enable us to help five additional families this year. Thank You Wilkinson Steel & Metals! grandpa, Mel Elias, who retired last year after 44 years at Wilkinson. We would like to thank the Wilkie staff for their generous support over the years! 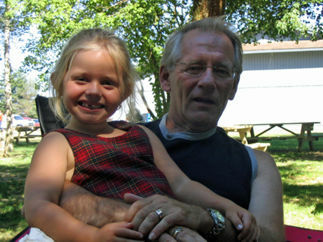 Over $2500 was raised in honour and memory of Gaby’s grandpa, Mel Elias, who passed away in November 2012. Thank you to all who came out to celebrate Mel’s life and honour his wish to support Gaby’s charity. Local writer donating partial proceeds of book to GDF! Lisa Sahli Graham, a Mom and teacher in the lower mainland has chosen the Gaby Davis Foundation as her charity of choice and is donating 1/2 of the proceeds of her book sales to our charity. hope that you will enjoy a copy of her book. We couldn’t have asked for much better news to start our 5th year! 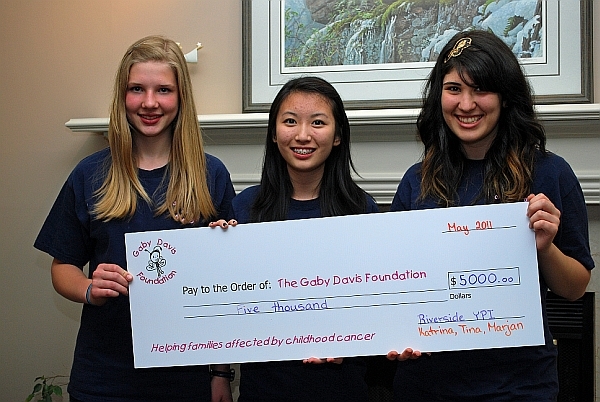 In June, the Gaby Davis Foundation was the recipient of the Toskan Casale Foundation YPI award of $5,000 after 3 local grade 10 students, Katrina, Marjan and Tina of Riverside Secondary won their regional finals of the Youth Philanthropy Initiative by presenting on the work of our charity. Then in August, GDF received news that Costco had opted to support our work by way of another $5,000 grant that was presented by Port Coquitlam Costco Admin Manager, James Hastings. This was particularly special as it is the first time that Costco has made such a donation on a national basis and the Gaby Davis Foundation was one of just 5 such recipients across Canada.